Could the common housefly, which has evolved to recycle nutrients from waste products, help address the Food and Agriculture Organization of the United Nations' warning that food production will need to double by 2050 to feed a growing world population? An interdisciplinary team of Cornell researchers in animal science, entomology, nutritional sciences, business, microbiology and immunology is investigating a system for using housefly larvae to biodegrade manure and harvest the larvae for use as protein-rich animal feed. Their research is published in the Feb. 7 issue of the journal PLOS One. Larva meal could address a pressing need to replace fishmeal in aquaculture. The massive demand for fishmeal to feed all kinds of livestock has led to overfishing of fish stocks worldwide. Larva feed is proving to be a sustainable alternative; it contains the right nutritional ingredients for feeding fish, poultry and other livestock. "I think feed from insects is the future of animal farming," said Vimal Selvaraj, associate professor of integrative physiology in the Department of Animal Science and a senior author of the study. "We are talking about something that has been untapped. Insects are very rapid biomass generators, and they do not have negative impacts when used as meal, as far as we know." The researchers – for the first time – analyzed how efficiently housefly larvae recycled nutrients from dairy cattle manure, and they measured the nutritional value of the resulting larva meal as a feed ingredient. "We concluded from the study that the overall composition of larva meal with respect to all nutrients, including amino acids and minerals, is comparable to fishmeal and would be a good alternative for use as a protein-rich feed ingredient for livestock," Selvaraj said. Their analysis showed that fly larvae lessened the overall mass of the manure and reduced total nitrogen by nearly 25 percent and phosphorus by more than 6 percent. Reducing levels of these nutrients in manure makes a more suitable compost. Otherwise, untreated manure used as fertilizer leads to runoff of excess nitrogen and phosphorus into streams and rivers, which causes eutrophication in lakes and oceans, contaminates groundwater and can spread disease. When researchers measured the nutritional values of the larva meal, they found it rivaled the highest protein feed ingredients, including widely used fishmeal. The larva meal contained 60 percent protein, had a well-balanced amino acid profile and 20 percent fat that was high in monounsaturated fats. The meal was also found to be a good source of calcium and phosphorus. Fly larvae yields equal about 2 percent of manure weight, which has led some economists to question the profitability of fly larva meal. Yet the U.S. livestock industry generates some 335 million tons of dry manure per year. 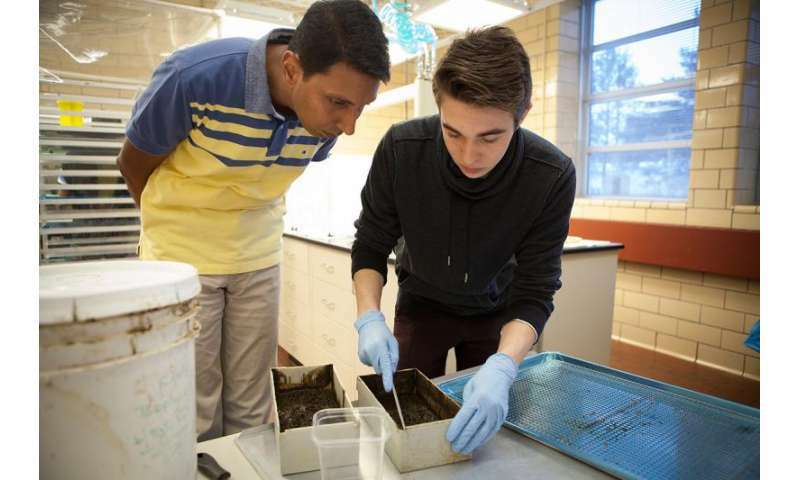 "In farming-dense regions there is enough manure available to have a substantial impact on larva meal production," Selvaraj said, adding, "This paper is a first step toward realizing this potential."